Because software is not perfect, every day new security vulnerabilities are discovered in the programs we use daily in our computers. 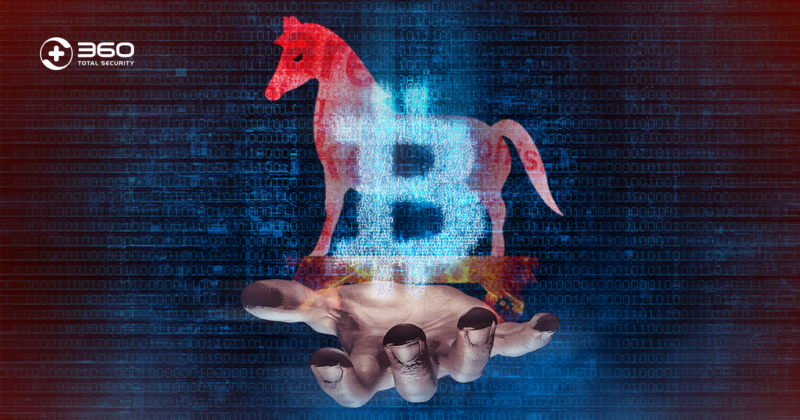 It is common to forget about regularly checking for those security updates and patches released by the software companies to fix newly discovered security holes. 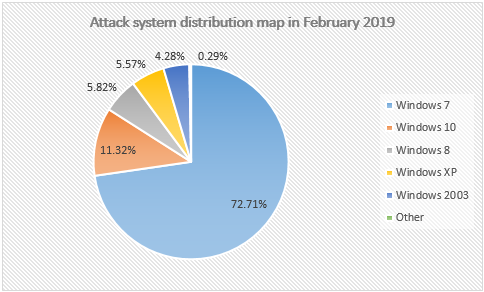 Attackers know that computers without having installed the corresponding security updates are vulnerable targets, and they will try to exploit these security holes to harm or gain control over those PCs. 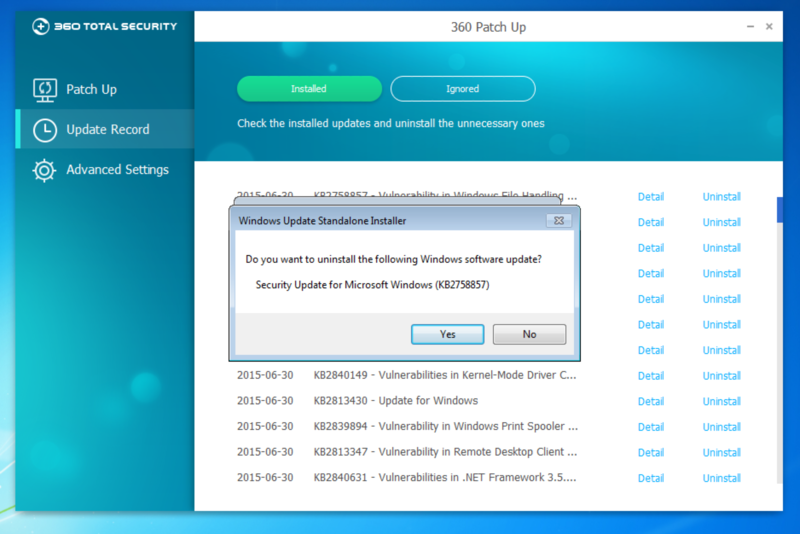 To prevent against this situation, software companies release security patches regularly. 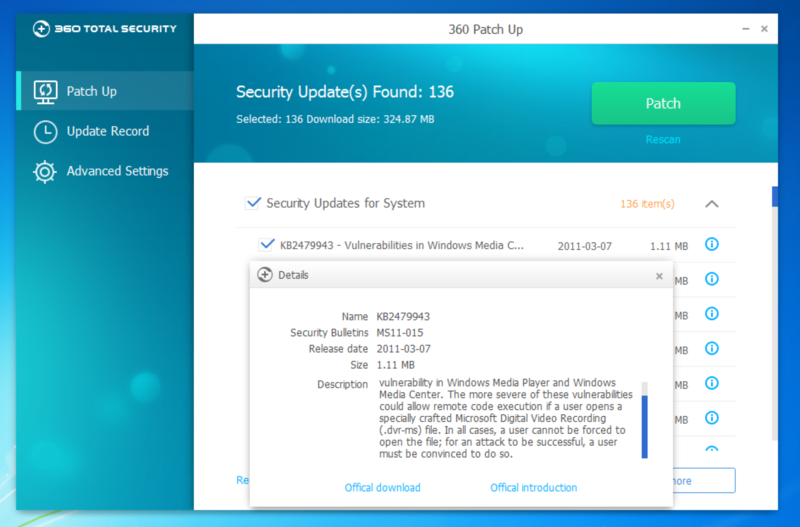 Patch Up feature assists you to manage and keep track of the latest security updates. 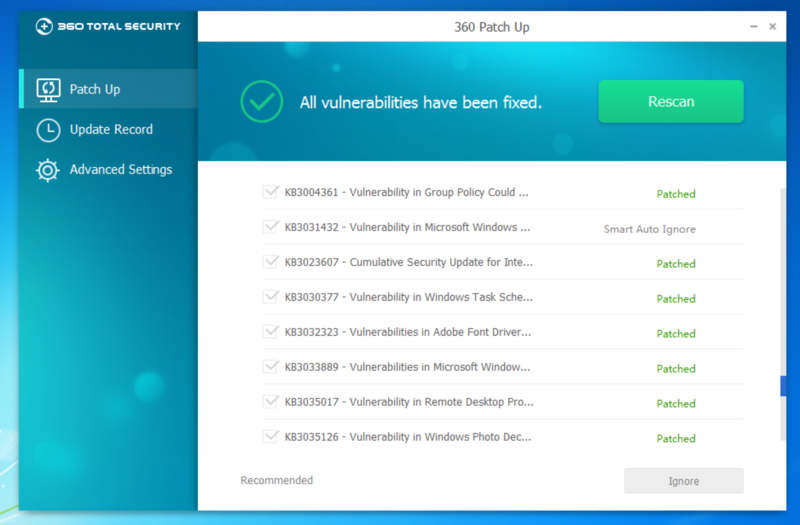 Patch Up centralizes Microsoft and Adobe security updates in a single place, enabling you to keep your operating system up-to-date with one click. Patch Up can be found in ‘Tool Box’ of 360 Total Security. 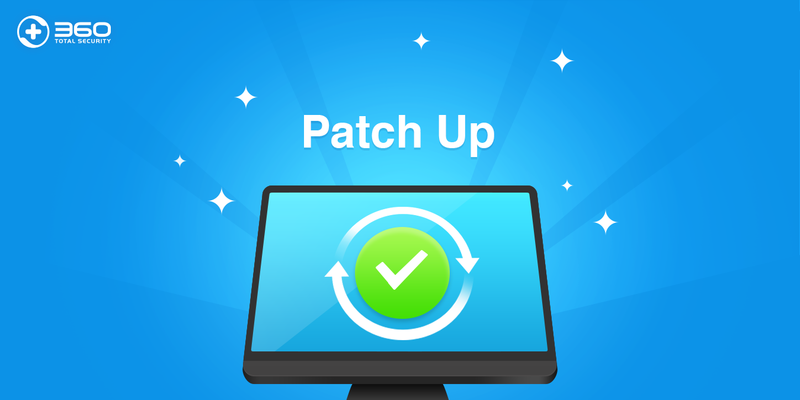 Once activated, Patch Up will automatically look for new available updates. The blue ‘i’ displays detailed information about each patch, such as Name, Release date and Description. 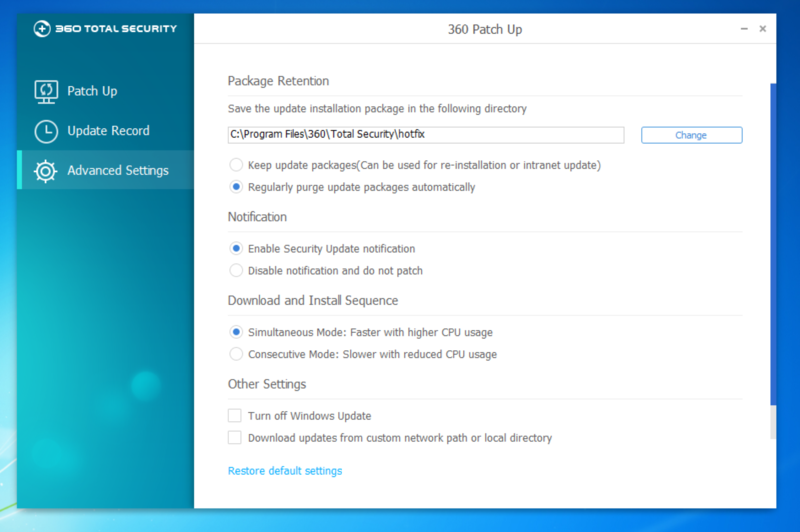 Simply click ‘Patch’ and then Patch Up will start downloading all the recommended patches. Other optional patches can also be manually selected to update. 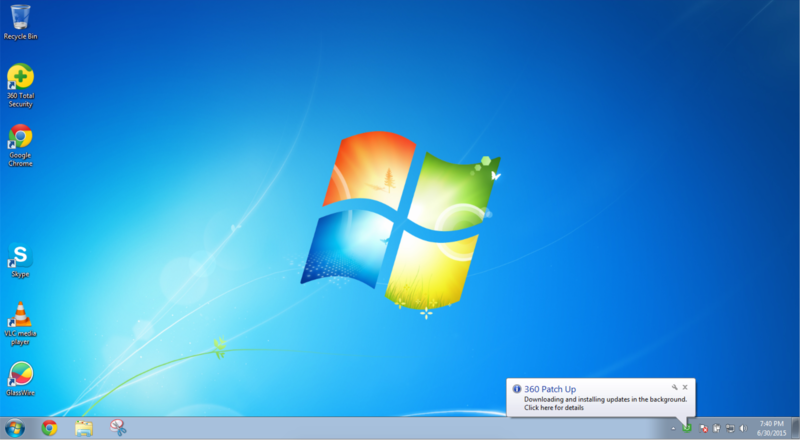 ‘Background’ minimizes the 360 Patch Up window from your desktop to tray icon, while the download process is still running. After Patch Up finishes the process, a report containing details of each update will be generated. 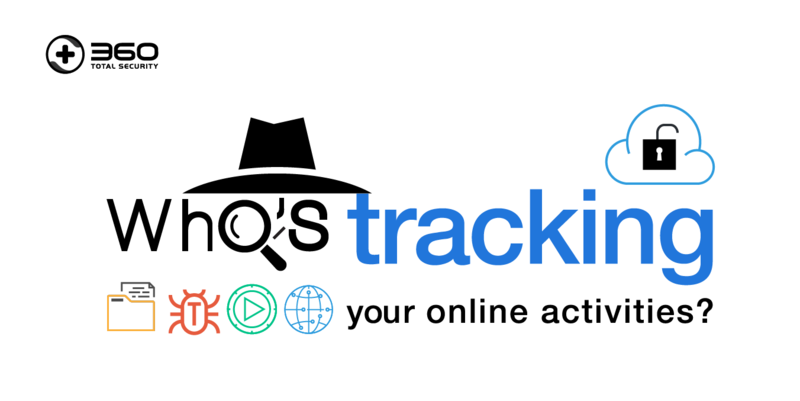 Check ‘Update Record’ to see all the patches. 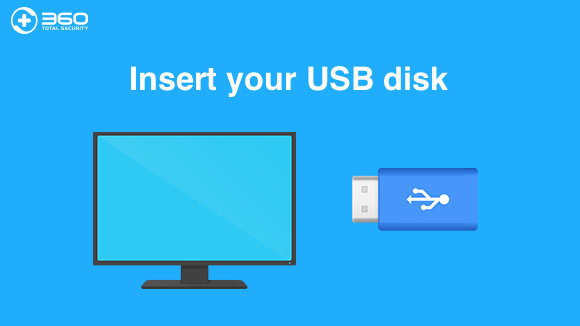 Here in Update Record, you can uninstall the software update and recover your operating system to the previous state. In addition, ‘Advanced Settings’ allows you to set up update frequency, notifications, and other changes. A properly patched operating system is critical to the security of your PC. 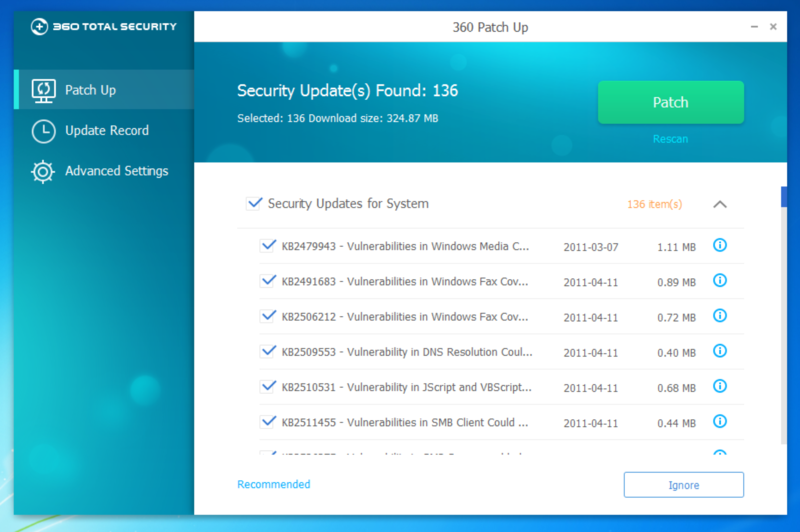 Use Patch Up to keep your operating system updated and fix vulnerabilities with a few clicks.